Created 4 Creativity : My Favorite Peeps! Easter will be here in just a few days now. We always have a huge family/friends gathering the Saturday before Easter and we are really looking forward to hosting everyone again this year. 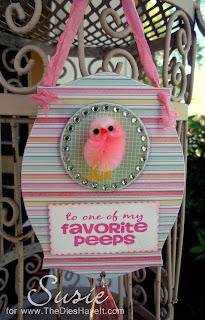 To celebrate, I made a fun little Easter tag using a sentiment from the Barnyard Puns stamp set from Joy's Life. Her sentiments are always right on target when I need a cute little saying. I stamped the saying on smooth white cardstock, mounted it on chipboard and die cut it using a Spellbinders scalloped die. The background piece is part of a Maya Road chipboard book covered in paper from the Dear Lizzy Neapolitan collection. 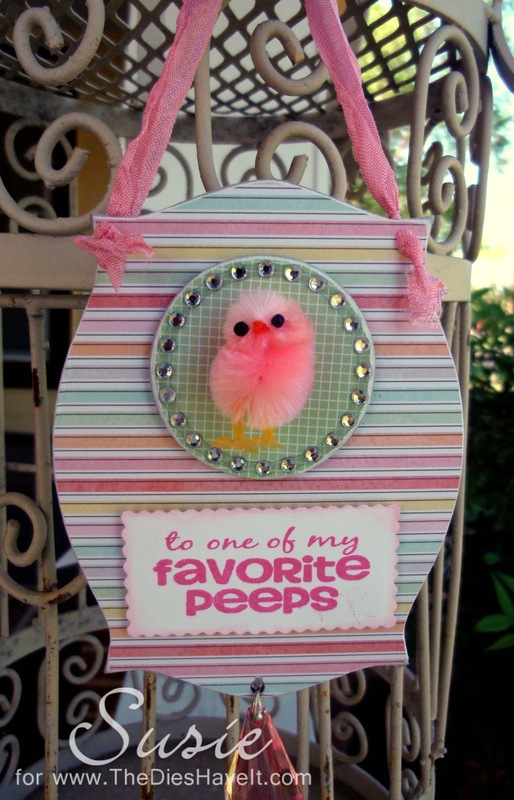 I also covered a chipboard circle with paper and bling before I glued my cute little PEEP to it. Adding some dyed seam binding and a cute bauble finished this up and now I have it hanging on my tag tree with some others I've made. Be sure to check out all of the design team spring and Easter projects here. You won't be disappointed!! I hope you have a wonderful day and will come back to see me tomorrow. I have another fun project to show you.